"This recipe has nothing to do with eggs. It is a CHOCOLATE SODA for all chocolate lovers. You can alter the amount of syrup to your liking." 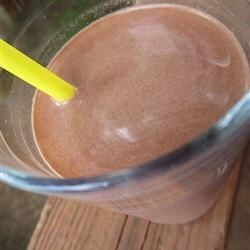 Mix the chocolate syrup and milk together until smooth in a large glass. Gradually pour in the seltzer water, stirring to combine (mixture will foam). Drink immediately. See how to make a classic drink from the old soda fountain days!